UPDATE: This blog post has gone around some, which is awesome, but I know these instructions are a little fly-by-night. If you want any help please feel free to comment and I will respond. It had to be done. It's so obvious that it's even been done before. This is my interpretation, made for the Great Geek Swap. My swapper partner likes Dr. Who. 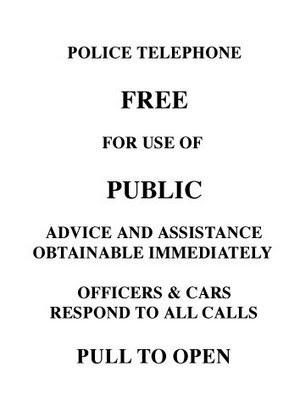 The BBC has actually copyrighted the TARDIS design, which is one of those interesting copyright oddities since clearly this "design" was just borrowed from actual police boxes designed for the London PD. Whatever, I'm not selling this. This should be about the size of the larger side of your tissue box. All the blue is one piece, and the dark blue sections form the top pieces. A base piece the size of the light blue area is also needed. And here's the sign I used (with Print n Press transfer paper). 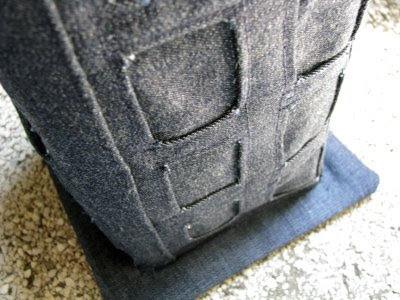 Print this out for use on one of the denim base (door) pieces. First step: cut interfacing into shapes based on template, then iron onto the denim. Notice one of the sides has to be split in half, for the door. Next, cut them apart, cut open the "windows" and baste the window seams under. Topstitch the window pieces on top of strips of satin, and the base pieces. 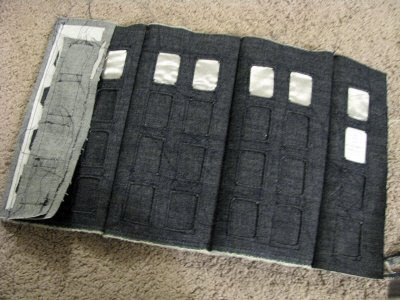 Then sew the sections together, with the "doors" on either end. After this I topstitched four corner pieces over the seams. 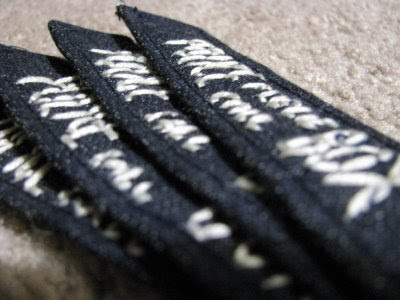 Embroidered "Police Public Call Box" labels. 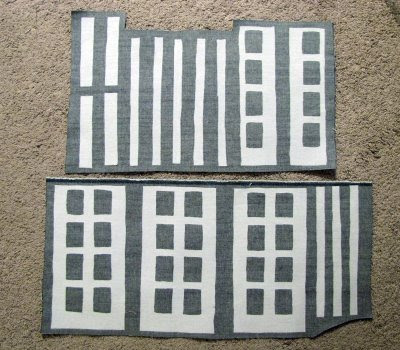 The window grids are also (very simply) embroidered. 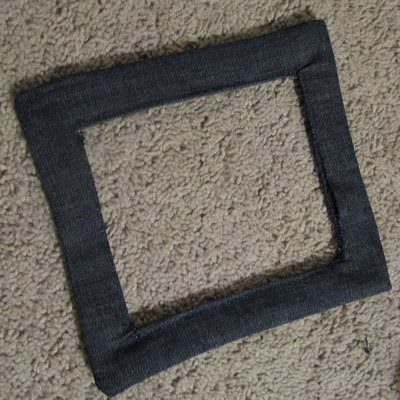 I cut out a square piece of denim big with sides the length of one of the panels. 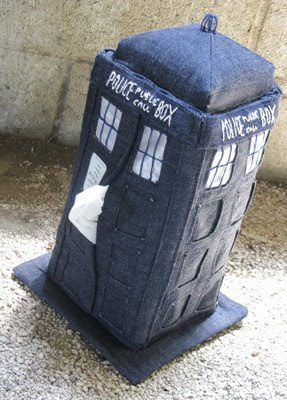 As tissue boxes are not square, this did not fit exactly, but the cloth was forgiving. I sewed this to the top of my panels. 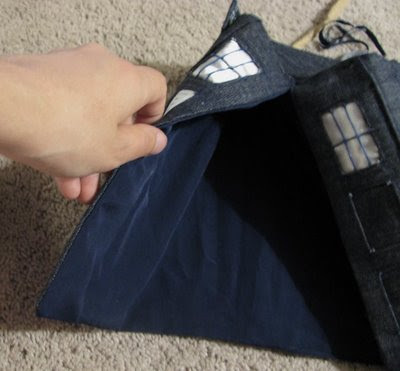 I added a lining to hide the embroidery mess on the inside. 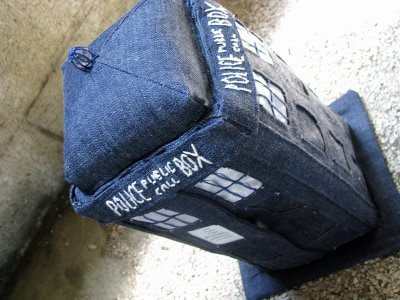 This was done by sewing together a lining in the same shape as the denim exterior, then sewing it to the denim, right sides together, and flipping it inside out. 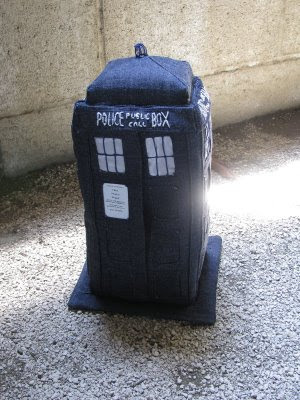 It would have been more awesome if I had found a lining fabric that had a big polka dot pattern like the inside of the actual TARDIS... but I already had this, and I like money. Both of these fabrics are leftover from a certain other cozy project. Almost done - just some last minute tailoring. I hand sewed the embroidered signs on at this stage. The top is just five pieces of fabric sewn together and then hand stitched to the top. It is tightly stuffed so it could be used as a pin cushion if you are so inclined to have a pin cushion on top of your tissue box. The "light" is a clear bead tied on with embroidery floss. 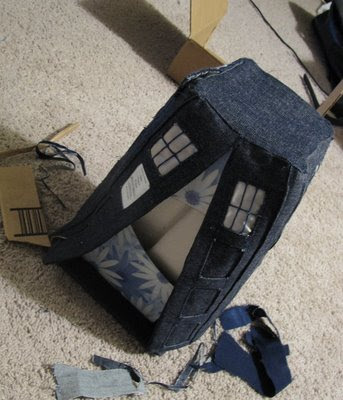 The base is made by sewing denim around a piece of reclaimed cardboard, and then hand sewn to the cozy. I made the base in the actual dimensions of the tissue box (rather than square) and then just pushed the fabric around until it fit properly. Some final product detail shots. There really is a tissue box in there. 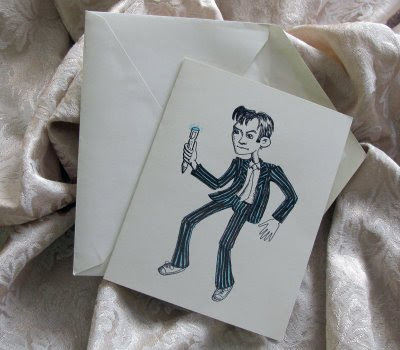 I also made a Dr. Who card, which I colored with a highlighter and a green marker. 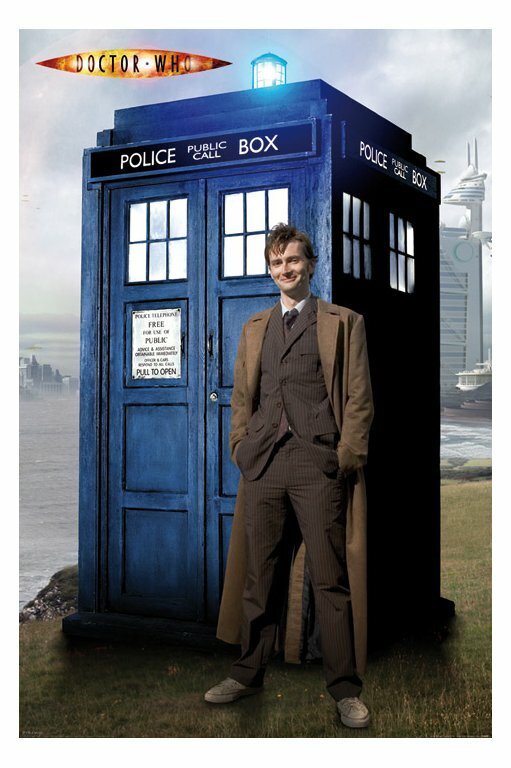 David Tennant, incidentally, looks like an older Scottish version of my brother. Who in turn looks like an older, American version of Daniel Radcliffe. 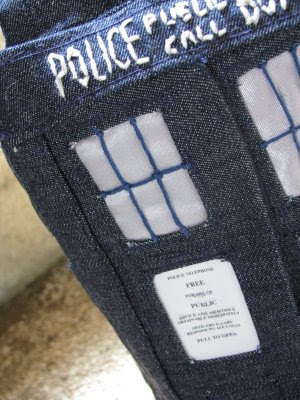 I wish they made real police boxes out of denim. 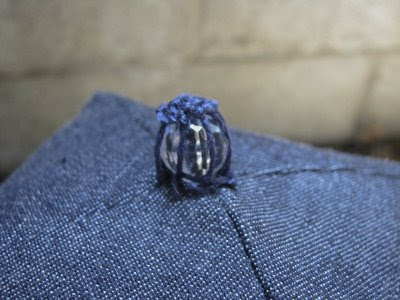 In fact, it should be mandated that 30% of freestanding structures should just be denim stretched over something like a geodesic dome skeleton, just because of how awesome this micro-structure made from denim looks. I can never think of things to make for my husband that I know he'll actually appreciate having/using. This is SO going to be made up for his next birthday! Thanks a gazillion! Thank you everyone! And zomg, I can't believe I'm on Craftzine... sweet! you are amazing. :) I might be a little bit in love with it. :) I also might need one in every room of my house. Awesome job. 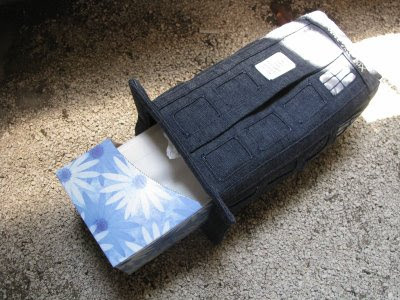 I'm trying to use scraps to make some sort of tissue-basket-dispenser-thing, but don't want to spend that much time. I have a simple design sketched and will try it out soon. You are so cool!! This is AMAZING!! Fabulous idea and fabulous job! Thanks for posting instructions too! I love this! Thanks for sharing it with us other fans! Very cool, I wouldn't mind having one myself. 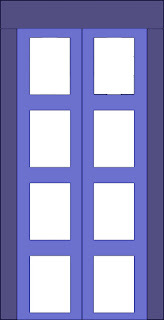 I'm including this in my G+ Group "TARDIS Builders Australia" for others to see. I'm dreaming of building the full sized one, maybe I'm crazy?